The fields time forgot . . .
Mary Green investigates some ancient meadows and verges. In May and June I walked along the little wooded ridge along the Blackwell Road out of Barnt Green, where they have been cutting some trees down to stabilise the railway. I was pleased to see that the old trees were doing fine (we have only lost some birches and one nice young sweet chestnut) and the bluebells have come out plentifully. On the far side of the railway the new plantation of trees is coming along beautifully. And the new hedge line near Alvechurch Station seems to be thriving, with the trees coming into leaf and the larger ones even blossom. Late spring and summer flowers continued to come quite late after a cold May. July is now the start of our holiday season, and it was traditionally a time for all kinds of local fairs and celebrations. However, there are few major feast days of the church or of the old pagan calendar reflected in country customs. I suppose the main focus of this time is the ripening of crops and start of the harvest. This of course remains in the long summer holiday that schools have traditionally had, so that children could work on farms. Those of us who grew up on farms certainly did, in the days when there was plenty for children to do to help out. I very rarely actually had a summer holiday, like most country children in those days, and certainly never a family summer holiday. Summer was a different kind of time, though. The working day was very long and there were no weekends off for most people. Despite this, summer was usually seen as an optimistic and positive time, with all the possibilities of the coming harvest – if the weather was right! And July holds the best-known weather prediction festival (alongside the end-of-winter one on Candlemas Day in February). This is St Swithin’s Day on July 15. Traditionally, if it rains on that day it will rain for 40 days. St Swithin was a well-known ninth-century cleric who asked to be buried in the churchyard, out of humility. Because he was revered, he was moved into the church, whereupon the heavens opened and it rained for 40 days (the length of time of Noah’s Flood, of course). So, if it rains on St Swithin’s Day, it will rain for 40 days. There is some doubt about whether this was a curse or actually a blessing! Rain is needed in summer, and a dry year can damage the harvest. Especially in apple-growing areas (like here) they saw the St Swithin’s rain as a blessing to the crop. But perhaps 40 days of it is a bit too much for the grain harvest at this stage. This is one of the weather predictions that makes some sense. Patterns of weather tend to hang around, so if it is wet it is most likely to carry on wet, whereas in a dry summer high pressure often gets established for a long time. As modern people we always seem to think of dry sunny weather as “good”, but of course rain of the right kind at the right time is vital for both agriculture and the wider countryside. Most weather predictions are really more about what has been rather than what is to come. So, the oak and ash one I mentioned last time is actually about what the early spring weather has been like. The forecast of a harsh winter if there are a lot of berries on the bushes is the wrong way round too – the rich berry harvest is about what the earlier year has been like. There is a local saint who has his day on July 17. This is St Kenelm, whose church is near Romsley and the beautiful Penorchard Meadows. His is a fascinating legend. He was an early ninth century boy-king, killed while hunting near Clent by a jealous sister’s lover. The previous night he had dreamt of his death, his dream including a tree decorated by flowers and lanterns. His body was hurriedly buried nearby, but was discovered by miraculous means and a group sent from Rome to find it and re-inter it near Winchcome. The “miracle” says that a white dove flew to Rome carrying the message that he was buried under a thorn in Worcestershire. When the delegation came to look for him, they found a thorn tree which had been visited by a miraculous white cow, which ate nothing but produced milk every night after sitting under the tree. There was the body. When they dug him up, a spring burst forth and produced health-giving waters. For some years after this Kenelmstow was a place of pilgrimage. Kenelm was a real person, a Mercian king. And there is a real spring nearby, though the current well is not the original location. Penorchard Meadows contain mounds which hide the remains of the village of Kenelmstow. The churchyard has a tree which is still decorated to bring good fortune and healing. And the “thorn tree” would have been a hawthorn, which as I described in May was often accredited with magical powers. It’s well worth a walk in Penorchard Meadows, now a nature reserve. You can get there from the church or from the Clent visitor centre. They are old grazed meadows and have orchids and other interesting plants like knapweed and lousewort. There is a spectacular patch of double buttercups, a sure sign of old pasture. A pool in one of the fields, which some think was the original spring, has lovely water plants. There are plenty of hawthorn trees! And the woods near the church are old woodland with bluebells, yellow archangel and wild garlic. On the side of the road opposite the church is one of a small number of protected road-verges. It shows you just what all our verges would be like if properly managed. They are full of common spotted orchids, along with dyer’s greenweed, bird’s foot trefoil, yellow rattle, moon daisies and later knapweed. “Properly managed” doesn’t mean anything difficult. It just means cut only once a year after flowering has finished, and the cut vegetation removed. This way they are like linear meadows. You can tell our verges would be rich like this, because if forgotten, as they occasionally are, they produce orchids and other lovely summer flowers. Any old meadows are worth a visit in July, before they are cut for hay. Eades is beautiful at this time of year. You can see why this kind of habitat is so important, because on a sunny day it will be full of butterflies and day-flying moths, as well as countless smaller insects. Even ordinary old pasture, like the lovely field in Scarfield Dingle through the little canal aqueduct, will be full of flowers, insects and birds. 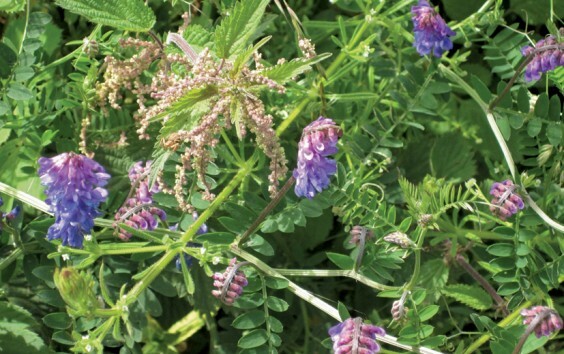 In July you can find sweet-scented lady’s bedstraw, knapweed, agrimony, cinquefoil, betony and self-heal, whereas in modern fields you will find very little but grass or corn. My photos this month are of the kind of flowers we could find around us on the hedges and verges if they were well managed. All of them are taken around the Village area, but most on just a few fields and verges which time has forgotten. The verge near The Weighbridge which was full of chicory and wild carrot has now been mown right down, so that’s gone. Some are taken along the canal, which remains a wonderful wildlife corridor when the fields around have become monocultures. I recently visited a nature reserve in Kings Norton, in the middle of suburbia. There was a great range of wildlife – birds, insects and water creatures – because there was a great range of trees and flowering plants. One of the volunteers there told me that he now lived on the edge of Birmingham overlooking farmland, but that he had to come into the reserve to see all the wildlife he was interested in – they weren’t there on the farmland. My neighbour’s garden pond, which the children inform me has three newts and at least one new frog, is more bio-diverse than a lot of farmland these days. I am lucky enough to live surrounded by a farm where this is not true. Over the last few years, an environmentally aware farming method has led to the range of flowers and trees increasing all the time, and with it the butterflies, amphibians and birds. It was a joy recently to see a new pond covered with water crowfoot, a lovely plant I hadn’t seen for ages, and a field full of hay-rattle. I am looking forward to seeing more flowers appear throughout the summer and the next few years. My poem is one I wrote in spring, but relevant all the year round. Open to the bees and to the eyes, hungry for spring. Until the summer comes and you find there’s no fruit. But you can’t, and they take their chances, naked in the wind. Ready for ripeness in the wasp-filled days. Life is good and the sun shines and we will survive. And one day we may wake and find no blossom. Fighting the dead hand, working for the light.